It’s time to head to the mystical Far East with this slot game, which will have you spinning in a beautiful environment. Thailand is well known for its rich culture and beautiful landscapes, which have been delighting casino gamers in this wonderful slot. If you’d like to be transported into this enticing world, give the Thai Flower slot game a spin. This game is brought to players by Reel Time Gaming and they’ve certainly created a unique slot game. There’s an explosion of colour and sound for anyone that chooses to spin the reels of this slot. It’s mobile optimised for your convenience too, so you can play wherever you like. 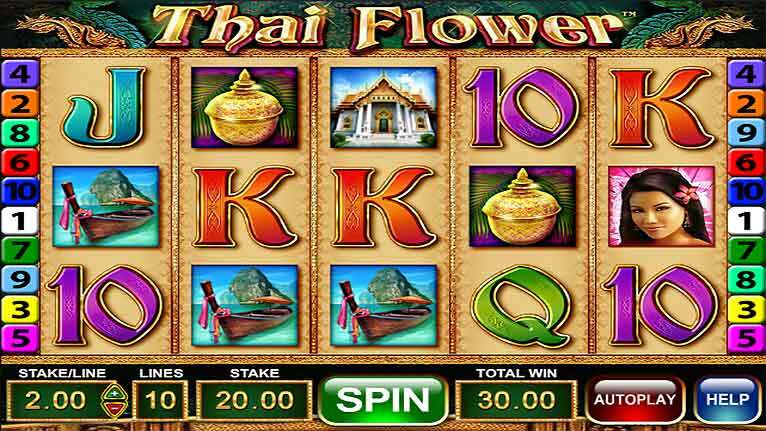 Thai Flower is a slot game that you’ll find on many casino sites all over the internet, as players simply can’t seem to get enough of it. The combination of the fantastic theme and intense gameplay make this slot one for the ages. 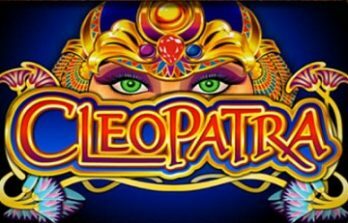 It might not look like a super modern online slot game, but you can rest assured that it contains everything you could need to snag some spectacular jackpots. The game itself really looks the part, with beautiful and bright graphics. On opening the game, you’ll be greeted by a Thai beauty who will show you to the reels of the game. The reels of the slot take up the traditional 5 reel, 3-row format that many players will be familiar with. Although it looks quite ordinary, you can prepare for some extraordinary wins when you play this slot. On the reels, you will find a selection of different symbols, each with their own individual values. There are playing card symbols on the reels, themed with a Thai twist that sets the game off with a bang. The pay table will tell you all about the specifics of each symbol, you can open it with the touch of a button. As you play, you’ll even be able to enjoy a lovely soundtrack that will help you to immerse yourself in the gameplay. If you’re not a fan, then you can always mute it by using the option just above the reels, though many players do choose to keep this active. Online slot games are generally pretty simple and you’ll have no trouble at all getting to grips with the Thai Flower slot. If you want to get started, you just need to set up what bet you would like to have on each payline. The ten paylines within the game are fixed, though you can specify the amount you’d like to spend on each of them. This gives the game a low minimum bet of just 10p, though if you want to spend a bit more then you could bet all the way up to £500. It’s safe to say that this is a slot that will be able to suit any budget. The great thing about Thai Flower is that with that fixed payline system, you’re always playing with the same chance of winning no matter how much you wager. With your bet in hand, it’s time to spin! Clicking that green button will start the action, then all you need to do is cross your fingers. 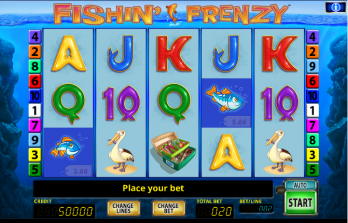 The aim of the game, as with most slots, is to match up three or more of the same symbol to release a jackpot. These symbols need to appear from left to right, on a payline for you to qualify. The more the merrier however, as more symbols within the winning combination will add a higher multiplier to your bet. The playing card symbols are the smaller multiplier symbols, though you can still look to make a healthy jackpot with these. The Thai lady herself actually makes an appearance on the reels too. This special symbol is able to pay you out a larger multiplier and also do so more often. Just two of these symbols will release a jackpot for you, so you can watch out for this symbol. If you’re looking to match up wins on this slot more often, then keep your eyes peeled for the wild symbol. This pink flower appears to make it much easier for you to win, as it can take the place of any other symbol. When you play the game, it will pop onto the reels and get you winning much more often. Wild symbols in slot games generally don’t take the place of every symbol but in this game it’s pretty powerful. When it comes onto the reels, you will be rejoicing as it makes your wins more frequent. It’s a lovely symbol to look at but it also has some serious effects on your jackpot winning potential. No slot game is complete without a cheeky bonus round and the one in Thai Flower can end up being greatly rewarding. The wild symbol actually serves another function in that it can also get you playing with free spins. To access this bonus round, you want to see three of these pink symbols on the first, third and fifth reels. When this happens, you’ll be transported into a mini-game in which you open the flowers to reveal the next part of the bonus feature. Press on the three flowers and you will see three symbols, these are the only ones that will appear while you’re playing for free. 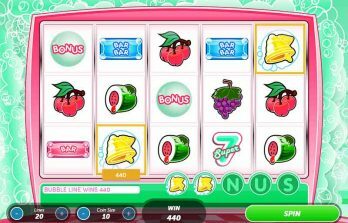 By eliminating some of the other symbols of the slot, it becomes much more likely that you’ll be able to win big in the freebie round. You’ll be playing with 12 free spins initially, though you can unlock more as you play through these. The reels will reward you with multipliers that act on the last bet that you made, so you’ll hopefully unlock this bonus on a high-value spin if you’re lucky. This bonus game can be a little trickier to trigger than other slot games, but it’s very much rewarding when you get there.